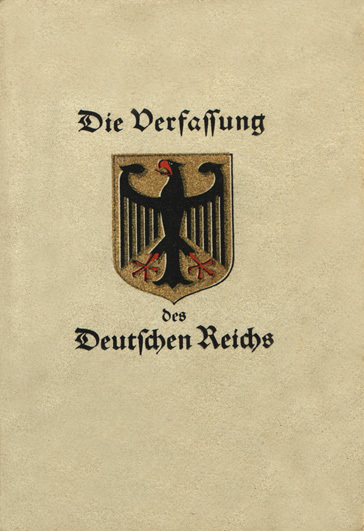 The Weimar Constitution in booklet form. This work has been released into the public domain by its author, JonRoma at the Wikipedia project. This applies worldwide. JonRoma grants anyone the right to use this work for any purpose, without any conditions, unless such conditions are required by law. current 04:50, 5 November 2018 364 × 531 (88 KB) Universalamateur Reverted to version as of 03:18, 31 July 2006 (UTC) -- who says that the cover was necessarily white?